If you are using Excel 2003 then you Select "View -> Toolbars -> Visual basic"
Selct Office button > Excel Options > Customise. You will need to choose all commnads and then add record macro button quick access toolbar. Hi Yogesh, thanks for your reply (I only noticed it today .. sorry). I know about customising the excel toolbar, to make it include the macro button. 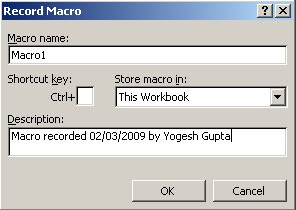 However what I am ultimately after is a keyboard shortcut to _record_ a macro (not to play it), similar to the behaviour of Ctrl+Shift+R in Visual Studio, which invokes the temporary macro recorder. The recording is stopped by typing Ctrl+Shift+R once more, and the macro is executed by Ctrl+Shift+P. This is a feature I am really missing in Excel and I can't believe that there is nothing like it. Maybe you know something? Thank you very much for your time. martin PS: Currently I am using excel2000. Thanks for writing back. I am also not aware of any such shortcut. Want to learn VBA language. Could you please advice on which institute gives good training. waiting for you reply soon..